The Survival Nepali Language and Culture Course (SNLC) is currently in its 6th week in BG Pokhara where the students have had the opportunity to experience Nepalese and Gurkha cultures in different environments including practising their Nepali language skills. The highlights of the past few weeks have been varied and wide ranging from preparing a traditional Gurkha Messing, running a Nepali Bingo night, and visit to the Kaski Residential Home (KRH) to participate in the iconic Doko Run – arguably the most challenging part of the course. 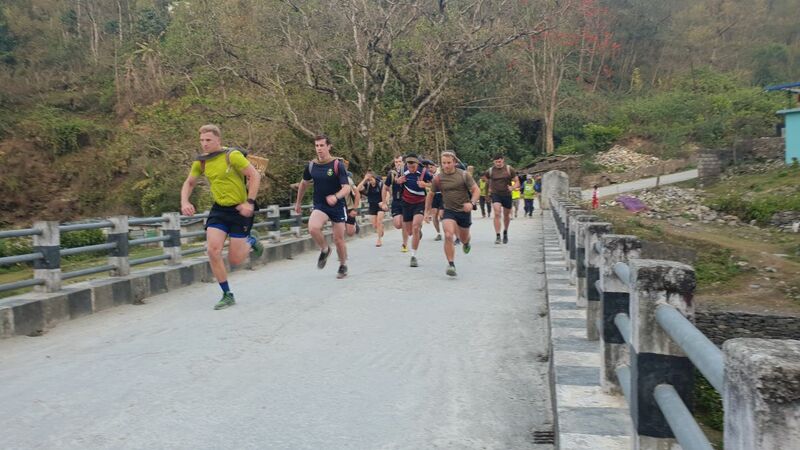 By way of background, the Doko Run is a gruelling assessment to test both mental and physical robustness of Potential Recruits aspiring to join the Brigade of Gurkhas. It is designed to force candidates to draw upon every last reserve of inner strength to successfully complete the arduous route. It is without question the hardest challenge of Gurkha recruitment where Potential Recruits put 15 kg bags of sand into their Doko – a traditionally wicket basket which is carried on their back, run along a 5.8 km uphill mountainous trail that has to be completed in less than 50 minutes. The Young Officers attending the SNLC go through the exact Doko Run assessment that the Potential Recruits go through during Central Selection in the vicinity of Bhalam Danda, a punishing steep incline of mountainous terrain. The SNLC Doko Run was a fiercely contested event which took place on Fri 22nd March 19. All the SNLC students completed the Doko Run within the stipulated time with Lieutenant Alex Hoccom, Queen’s Own Gurkha Logistic Regiment, coming first in an incredible time of 38 minutes 44 seconds.